Acknowledged author Jerry J. Weygandt wrote Intermediate Accounting, 2 Volumes comprising 1552 pages back in 2016. Textbook and etextbook are published under ISBN 1118743202 and 9781118743201. Since then Intermediate Accounting, 2 Volumes textbook received total rating of 4.5 stars and was available to sell back to BooksRun online for the top buyback price of $81.34 or rent at the marketplace. 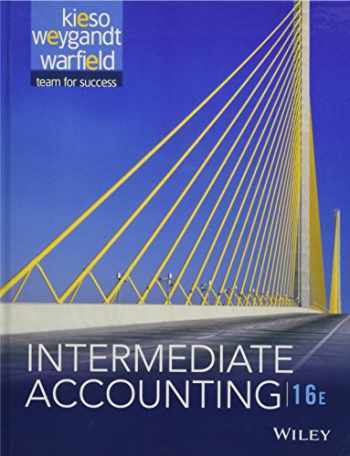 Kieso, Weygandt, and Warfield’s Intermediate Accounting, Sixteenth Edition continues to set the standard for students and professionals in the field. The 16th edition builds on this legacy through new, innovative student-focused learning. Kieso maintains the qualities for which the text is globally recognized, including its reputation for accuracy, comprehensiveness, accessibility, and quality problem material that best prepares students for success on the CPA exam and accounting careers. The 16th edition offers the most up-to-date coverage of US GAAP & IFRS in a format suited to the complex challenges of teaching intermediate accounting in these changing times.